Guard Jordan Roland helped Le Moyne College coach Patrick Beilein captured his 100th win as a college coach. 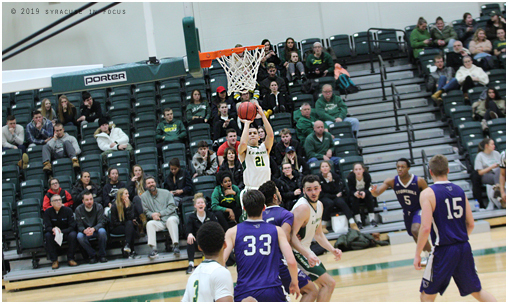 The Dolphins defeated Stonehill College 66-60 on Wednesday. Roland finished with five points, five rebounds and three assists. Le Moyne head basketball coach Patrick Beilein (above) played for his father John at West Virginia University. John Beilein is currently head coach at the University of Michigan, but from 1983-92 he was Le Moyne’s head coach. Patrick had a 22-7 record with Le Moyne this year.